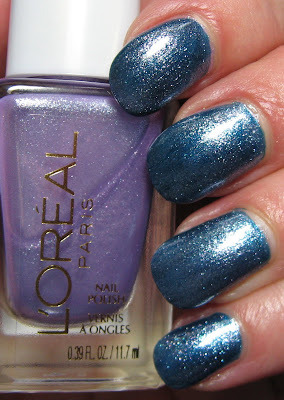 Above & Below: L'Oreal's Party Hop is shown using 2 coats. The finish on this shade is multi-faceted: part shimmer, part glitter, part foil. The glitter is very fine and holographic, although the holo was not captured in my photos. If you come across this one, you'll see the holo glitter more in real life. Below: This shade also works nicely as a layering polish. 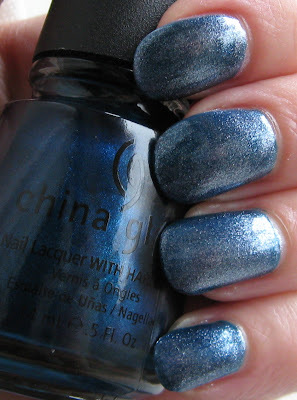 It's shown here over China Glaze Rodeo Fanatic, a darker blue shimmer. While perusing the aisles of Meijer looking for new drugstore polishes, I came across L'Oreal's Party Hop in their permanent display. I'm not sure how it is that I've never seen this one before, but the tiny holographic glitter caught my eye, not to mention the delicate shade of lavender that I thought was perfect for Spring. 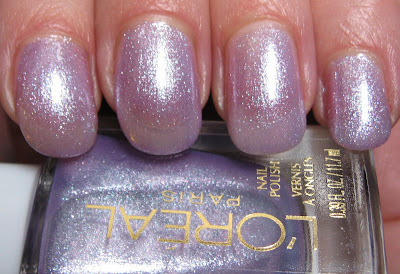 If you click on the link above to this polish on L'Oreal's website, it looks like an ordinary lavender creme. Their photo looks nothing like the real thing, because this is a fairly sheer lavender or light amethyst color with glass-flecked holographic glitter and a slight metallic or foil finish. I used 2 coats, and for a more opaque look I'd recommend 3, although I love how this polish looks alone or as a layering finish to a darker shade. It seems that sheer polishes don't bother me if they're glitters and shimmers, nearly as much as if they're cremes. I wish they'd come out with some new shades though--it's been a while, hasn't it? Gah!! Is this a current shade??? I'd passed on this color for so long because it was such a feminine color. I guess I'm more into some of the edgy stuff. But seeing it on you, I think I may want to buy it now. 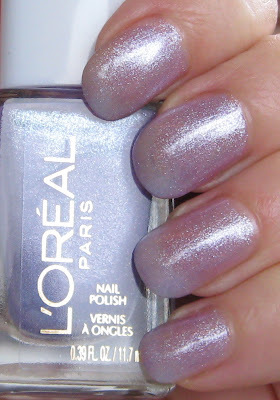 L'Oreal has these polishes at my Wal-Mart and KMart, so I think I'll look for it at my next opportunity. It looks awesome over that teal! Very nice, I like the layering. Mary I think we love the same shades and ideas in polish. I agree with the sheer polish thing. Give me some shimmer or glitter in a sheer and I just may love you. That is lovely on you. Also looks fantastic as a layering polish. Have a wonderful and blessed Sunday. ooh party hop is so pretty! I just ordered this polish from Drugstore.com. I've been wanting it for a long time, but I didn't want to pay full price. Of course, when Loreal's polishes were on sale, they'd have no bottles of Party Hop left. Luckily, it was BOGO, so I got a pretty coral color too. The reason I ordered Party Hop online, is because lately I've seen no Loreal polishes at all the stores I've been to lately. None. Just a print ad on a box that's been put into the space the polishes used to be kept in the display. Makes me wonder what they have planned for the future. Me, I'd like to see them do polishes under the HIP line. Lizzrd~as far as I know, yes! It was on their permanent display. Silver Diva~I don't know why I never saw it before, because I know I would've purchased it on the spot! Lucy~it was the tiny holographic glitter that caught my eye on this one. I just love it. Skye~thanks, glad you like it! Angie~isn't it though?!! I love the little glass flecks. SilhouetteScreams~I like it better by itself, but I'll have to try it over a few more colors to see how it looks. auroragyps~hmm, interesting about the displays. I keep waiting for new polishes from them, but no luck so far. Polishes under the HIP line would be fantastic! This polish has been sitting in my mom's nail polish stash forever. I already had a purple/gray polish on my fingers and was looking for something to use for Konad-ing. Party Hop had been sitting around so long that it looked like lavender with a ton of silver shimmer. This didn't work with the stamping (which didn't really surprize me), but trying it did make me see the holo shimmer. I ended up painting over my nails with Party Hop and now they are an awesome, almost metallic, grayish lavender with holographic shimmer. I've been wanting to buy a purple holo and didn't even know we had one in the house. haha. :) It looks lovely over the blue China Glaze, too. I'm looking forward to the endless combinations.